Nicole Wede is a 2013 graduate of Northwestern’s nursing program. She has worked as a registered nurse for the Orange City Area Health System and Sanford Medical Center in Sheldon, Iowa. Wede has experience as an emergency room, obstetrics and medical surgical nurse. She is also a certified Basic Life Support instructor. In addition to her B.S.N. 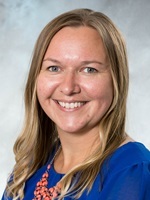 degree, Wede holds a bachelor’s degree in psychology from the University of Iowa, and is enrolled in Nebraska Methodist College’s nurse educator master’s degree program.